QUAKERTOWN, PA - October 1, 2010 - WastewaterPR.com - This new line, which includes an industry-leading Herr-Voss Stamco Precision Leveler, will allow Penn Stainless to supply their customers with plate and sheet product of superior flatness. 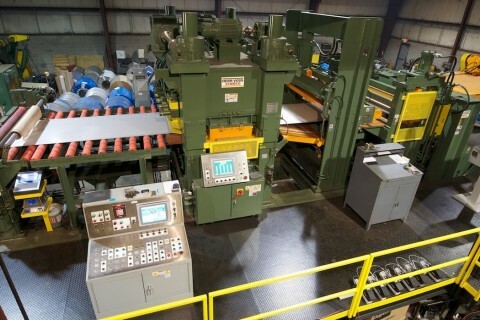 Penn Stainless Products has installed a Heavy Gauge Cut-to-Length Line from Herr-Voss Stamco. This new line, which includes an industry-leading Herr-Voss Stamco Precision Leveler®, will allow Penn Stainless to supply their customers with plate and sheet product of superior flatness. Penn’s current coil inventory includes: 304, 304L, 316L, 321, 309, 310, 409, 2205 and LDX 2101 in widths up to 72 inches. The line can process stainless steel coils up to 50,000 lbs. x 78” wide, with a thickness range of .090” to .375”. The cut-to-length line includes an overhung mandrel-type uncoiler, three-roll breaker, entry-crop shear, Precision Leveler®, vinyl applicator, down-cut shear, drop-type stacker, line marking, pack lift and run-out conveyors. John Marzula, director of engineering for Herr-Voss Stamco stated, “Working with Jim [Seward] and Bill [Clerihan, Penn Stainless plant manager], we identified Penn Stainless’s expectations and requirements, which resulted in many key features for the line. The heavy-duty leveler with 4” diameter work rolls provides the necessary muscle to process 3/8” x 78” stainless steel along with the finesse required to level material as light as 13 gauge. Additionally, the rebook mode reduces scrap losses while improving production when processing short runs.” About Penn Stainless: Penn Stainless is a full line supplier and processor of stainless steel sheet, plate, bar, structural, pipe and tubular products. Penn serves domestic and international customers in stainless, high-temperature, corrosion, Duplex and PH alloys. Besides leveling, Penn Stainless offers extensive cutting services, including: plate shearing, sheet shearing, plasma, HQ plasma, and dynamic waterjet, as well as machine, saw and Amada production cutting. About Herr-Voss Stamco: Herr-Voss Stamco is a leading designer and manufacturer of coil processing equipment including slitting lines, cut-to-length lines, tension leveling lines and precision roller levelers.